For a brief period of time, I thought I'd lost my new hoe●dag®, the very hoe●dag® I recently reviewed and professed my love for. It happened this evening. I had just finished mowing the lawn and was planning out in my head what I want to do in the garden on this lovely long holiday weekend. Some of that "doing" was going to involve my new hoe●dag® but it occurred to me that I didn't know exactly where it was. So I decided to go looking for it. I wanted needed to know with certainty where the hoe●dag® was so that when I was ready to use it, I wouldn't waste time looking for it. Where was my new hoe●dag®? What had my nephews done with it? They are working in my garden helping with some of the heavy lifting and I am generously letting them use any tool they want to use. They want to use the hoe●dag®. Had they left it in a flower bed? Buried it in some mulch? Maybe they were just having a little fun and hid my new hoe●dag® from me? DO NOT HIDE AUNT CAROL'S GARDEN TOOLS, ESPECIALLY THE HOES, UNDER ANY CIRCUMSTANCES. I looked high and low amongst all the hoes, and finally found it, nicely hung up on the pegboard. Whew, that was close. Stand down. Everyone may now continue what it was they were doing. Ha ha! No one was playing a joke on me. All is good. I know where my hoe●dag® is. Do you know where your hoe●dag® is? Do you even own a hoe●dag®? Would you like to own a hoe●dag® to use in your very own garden? If you would, then this might be your lucky weekend because the wonderful people who make and sell the hoe●dag® are sponsoring a giveaway of a new hoe●dag® right here on my blog. To enter, leave a comment below telling us what garden tool you've lost that you really miss. Gosh, yes, your mind counts as a gardening tool, if you think you've lost your mind in your garden! One lucky randomly drawn winner will then have their choice of a plain-handled hoe●dag® or one with a handle painted by The Gourd Fairy. 2. Please make sure I can get to your email address via your blog or leave it in the comments for me. You can and should disguise your email address something like this: "Indygardener AT G mail dot com, and I'll figure out what it is. 3. US and Canadian residents only. 4. Enter by commenting before Tuesday, June 1, 2010, 9:00 PM EST. Winner will be chosen shortly thereafter and notified via email. Now, tell us about that missing garden tool that you can't find and really miss and you might win a new hoe●dag®. (Update June 1st - The winner is commenter 14, Rebecca! Congrats and thank you to all who entered. Well, I used to have a miniature mattock, not too different from a hoe*dag. One day I looked around and couldn't find it. Not sure if someone stole it off the front lawn, or the kids used it in one of their projects and never put it back. I keep hoping it will show up in a compost pile or something. I lost my compost aerator and my compost misses it very much! Mostly I think of plants I've lost...and tools buried for decades that I've found when digging a new bed! I promise to take good care of my hoedag...robinm at austin dot rr dot com . This would be my first hoe. I lost the very best set of garden clippers. They were wonderful. I, (in a moment of stupidity) laid them on the back bumper of our truck. That afternoon I watched hubby & daughter drive down the road and thought Where are my clippers!!! They were never to be found. Later, I even made hubby drive slowly down the road so I could look and see if they were laying on the side of the road. My pointy hoe! I've no idea what happened to that lovely weed-gitter. I came to love the one that my Grandma Violet had, made DH get one for me when we decided to put in the veggie garden. Somewhere deep below the soil along the trellis on the north side of the house, there lies a trowel which was carelessly abandoned there by someone who shall remain nameless. I can't say she misses it but she does wonder if a future generation will unearth it and marvel at its pristine condition. You have my e-mail and you're not afraid to use it. Somewhere, over the rainbow, many gloves are dancing a jig. Finally free to do what they want. And my poor bare hands, and broken nails, will just have to make do. 1. Why do all my trowels have green handles? I always intend to spray paint them and never do. As a result, there are at least three buried in my yard somewhere. 2. Last fall I lost my metal snips. Searched everywhere (or so I thought) and couldn't locate them. So I eventually bought a brand new pair. Not nearly as nice as the old ones, but they'll do. The next day my parents came to visit. Dad always brings odds and ends he finds at yard sales. This trip he brought me some metal snips, exactly like the ones I'd just bought. As I was looking for a place to put the duplicate, I found the original snips, casually left on a box, behind the bag of perlite I'd apparently cut open with the snips at some point. So now I have three sets of metal snips. But I don't have a hoe*dag! I can do one better, I am losing my garden. We are moving in a few days, and although I will have a nice big yard to plant in, I have to start from scratch. This would surely help..thanks for the contest. I lost my gardening gloves and had to buy new ones. I used to have one of those tools that takes out dandilions but for the life of me, I cannot find it now. I have recently lost my hoe. I keep looking for it. I have had it for about 15 years. It was actually made as a childs garden hoe, but it had a longer wood handle and was made really well. I can't find it anywhere. I miss it so much. It's comforting to know others have misplaced their garden tools. Just yesterday, I misplaced my favorite hand cultivator. I retraced my steps and yes, there it was. I've love this new invention and then I could do more gardening standing up and I wouldn't misplace it. Two of the lost garden tools I miss the most are my Japanese garden knife and small snippers perfect for deadheading. As an aside, the tools I'm borrowing, for the most part, were my *Grandfather's* tools - still working well after how many decades of use! My mom's hand clippers. Still sharp after almost 50 years, well at least they *were*. I was trimming a couple of limbs off of a large ligustrum in a wooded part of our yard, and sat the clippers on the top of the ladder while I asked hubby to help me with a larger branch. We he came out to help, he grabbed the ladder to move it, and apparently flung my clippers into the lost universe. Two years of looking in the area leaf litter has not turned them up. I miss my gardening basket that my sweet sister gave me to carry the bounties from the garden. I probably shouldn't be as sad about the loss of this tool as I am, as it was never mine to begin with - my grandparents had THE best pair of of pruning shears _ever_. They had to have been made in the early 60s, and they took down whatever was in their path, and stood up to the abuse the teenage me, grumpy about being sent off to do yardwork, could throw at them. They had plain wooden handles, and the blades were dark, but still as sharp as knives, though I never remember Papa sharpening them. Anyway, fast forward to a few years ago when my husband and I bought our own house and I suddenly had a yard of my own. I picked up a pair of shears from HD, but they just didn't seem right, and I remembered the old ones back at my grandparents - so next time we were in CT, I went searching for them (w/ Grammy's blessing!). They weren't in the garage. No in the shed. In desperation, I searched the porch and the spare bedroom. Nope. GONE! No one remembered lending them to anyone, they were just gone! I lose my Felco hand pruners on a regular basis. I have two pair and most days, I can't even find one to use. You'd think the bright red handles would help, but they don't. I lost a tool called a hori-hori knife that was good for so many things. It was a gift from my former boss who was also a gardener. It had a sheaf to keep it in and I used it all the time. Have not been able to find one since. The hoe-dag looks like a great tool. Thanks for the contest. I love to be in the garden..it is a reward for all the ucky housework iI need to do...UGH! Somehow I lost my zig-zag toothed hoe (I don't know the technical name for it), but I can't find it, nobody claims to have used it, so it is gone. It did the best darn job of getting out those dandelions! I am at saltysailors at g mail dot com. I lost my favorite old wooden handled screw driver that was the perfect weeder. I keep hoping it will show up under a shrub somewhere. I lost my long handled pruning tool. I've been looking for it for weeks. I finally asked my husband to keep an eye out for it, yesterday. He found it for me, right where I left it the last time I used it. I don't know why I didn't think to look there. Silly me, I kept looking in the shed, where it belongs. We recently lost our hoe and garden rake. No one had it so we went and bought them as we needed them for the veggie garden. I can use the hoe.dag. Yes, I can. Can't find my Fiskars pruning saw - the best and fastest saw for pruning our lilacs I've ever found. Would like to try this hoe-dag, even though it sounds like sixties surfer talk. I can't find a trowel without a bent handle. I think I've used several of them for jobs that should've gone to a heavier duty tool. The others seemed to have disappeared. Lost my red-handled clipper yesterday. Looked high and low, near and far. Finally found it nestled in the grass where I had dropped it in order to pull out excess cup plant that was crowding out everything nearby. Now I can clip again. Whew. I'm a hands-and-knees gardener and one of my favorite tools was a small hand rake that I use for loosening the mulch around plants. I was crushed when I lost it. I waited two years before buying a new one only to find the original under a pile of leaves a few weeks later. Just recently, I lost my Fiskars. I put them down and moments later I couldn't find them anywhere. As I'm right in the middle of cutting down all my spring meadow plants by hand, I had to buy new ones. My biggest loss, however, has been my Japanese hoe. It is my favorite but the handle came off. I've tried superglue and epoxy but neither takes the stress. I really miss being able to use it. After reading your review, I think a hoe•dag might make a good replacement. I had a hoe that was handed down from our parents and I can't find it anywhere, I loved that hoe! I have searched everywhere for my dandelion digger - can't find it anywhere. To make matter worse I'm convinced a friend of mine sneaks into my yard and garden to fertilize any dandelion she can find. I have lost the tips of my gardening gloves. I think a hoe.dag would be just the thing so I wouldn't have to wear out all the finger tips. I lost my rototiller! It must not like where I put it because one day it went a walking... The hoe.dag looks like it can conquer a kingdom of weeds. Their not really a tool but I used them a lot and they were my favorite. My gardening gloves. I bought a new pair but they're just not the same. I'm thinking the dog got them. I lost my garden hoe! I looked indoors and out for it but can't find it any where.. I believe it's locked in my neighbors garage!.. She borrowed it twice before she left to visit her daughter in California and I thought she had returned it until I needed to remove some weeds the other day and could not find it any where! She won't be back until after the 4th of July... Dag-it! I need a hoe-dag! I don't think I've ever actually lost a garden tool. I have misplaced them plenty of times though and driven myself crazy (and others) until the tool was found. I really enjoy your blog. We just bought our first home. I am trying to start a garden and this would be helpful!! I have been bless to inherit many tools from my parents and grandparents, but out of all of them, my favorite is the perfectly balanced pickaxe. I feel like Wonder Woman when it is in my hand. Nothing can stay there if I put my pickaxe to it. Well, nothing greater than a 4 inch diameter wild privet hedge. In the wild frenzy of removing zillions of Hackberry Tree seedlings and wild privet hedge, it was covered up in the leaves. With the wooden handle, it blended in perfectly with the brown fallen leaves. It was getting dark, so I had to give up looking for it, or find a snake instead. I did find it in the bright light of the sun. Now it wears a bright hot pink surveyor's tape tied around it, easy to spot. Yes, it is one of the tools that always goes with me with I 'go out' into the gardens on my property, along with hand pruners and weeding tool. Sue's email address is riverpointlabs@bellsouth.net. And, I wish I could edit my comment. I meant to say 'nothing smaller than a 4-inch diameter wild privet hedge. It is late and I'm tired from mowing/edging/blowing, planting a dogwood tree, an oakleaf hydrangea, and constructing an arbor for my clematis. Are you crazy like me? Thank you for the chance to win something. 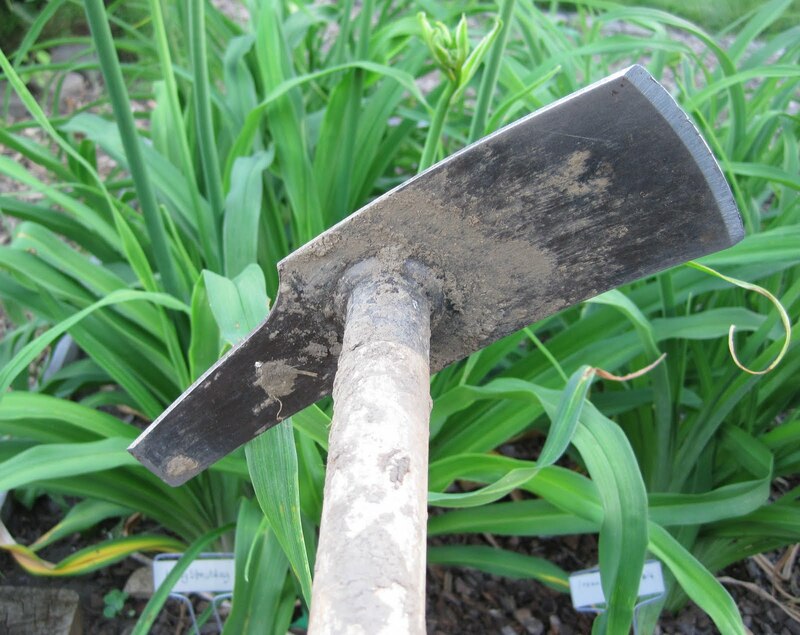 I would love to add this hoe-dag to my gardener's tool belt. I miss a garden knife I had for years. It just disappeared as things sometimes do. 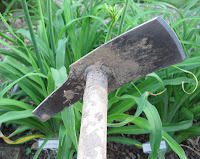 It was so useful for dividing things like hosta and iris. My mother's the gardener in this conversation, and what a garden she has. One tool thats causing her grief is a German watering bottle, which is finally wearing out. Too many years of use. So, not exactly a lost item, unless you count something favored that is slowly going away. Just yesterday I searched high and low, all around the house, garage, and garden, for my weeding tool. It's a basic, long metal tool with the v-shape at the tip of it. I am absolutely LOST without it!!! It is so basic, yet so crucial! Saves my hands from a lot of stress and later....discomfort. Without it, I am trying to pull them and we all know the roots on weeds NEVER want to come out. I was unable to find it, and now need to replace it. As soon as I buy a new one, it will probably show up somewhere!! I could definitely use something like a hoe-dag. I've never had anything like it, and would love to try it!!! Thanks for the opportunity to win it!! My daughter moved out a couple of years ago, and she is a talented gardener, so I am missing her, as are our flowerbeds. I lost a weedwhacker once...left it in the front yard while I grabbed a bag in the garage and someone drove by and stole it off the front porch. I constantly drop my pruners in the landscaping and then have to go on a search & destroy mission to find them. I used to have one of these and a pitchfork, both of which went missing a couple of moves back. I think the hubby forgot to pack them in the truck. I finally replaced the pitchfork, but haven't seen one of these in stores around here. I miss it, because it was super useful! I have most definately lost my mind. But that is O.K.,l now I use that as an excuse for my actions. Always love a new tool for the garden. I actually have very few garden tools. One shovel, one garden fork, one rake, these are all at least 35 years old, probably more! I have 2 spades, and one hand forky thing, these are only slightly newer. I occasionaly "misplace" these, but they always show up pretty quickly. I would really love a brand new hoe-dag!!! I once used a gas powered cultivator, borrowed from a gracious neighbor; I loved that thing! She used it to expand her garden area and I used it more like an edger. Great tool, but hard to start, so I am back to my manual tools. My circle hoe seems to have disappeared. I lost my dad's dibbler, it was passed down from his dad who used it in his Victory garden in WW II. I was devastated. I almost cried. Then one day my daughter spotted it in the garden behind a shrub sticking out of the ground like a cut off stump. I was so happy, now I make sure I know exactly where I place it. I don't have a hoe*dag. But I bet I could sure use one. I love my shovel, which is essential in gardening. Well, I thought I'd posted something but IT got lost! I've lost a favorite trowel and once had a hatchet disappear for several years in a very small garden. It finally reappeared under a pile of plant debris only slightly the worse for wear. After being resharpened, it gave many more years of service. Roving bands of bandits regularly steal my two trowels. One is so old and weathered the wooden handle, grey from years of being left in the rain, is split. The other is fairly new. But the trowel bandits have already absconded with it. It turns up, of course, where those bandits have squirreled it away, sometimes behind the hostas, other times underneath a garden chair. They are such crafty bandits. The trowels, though, always turn up. But I have lost two spading forks. One belonged to my father who hated "yard work." The second was a gift from friends. It simply vanished into some garden ether. I have a third one, and it hangs quietly among the shovels and spades. But something tells me the universe hungers for that spading fork. Who knew whether it will be hanging from its peg tomorrow. We just lost out loppers. They were being used last week and now they have completely disappeared. Looked high and low, maybe they went out with the green waste. I have (had?) the Most Fantastic Pair of garden pruners ever made...except I can't remember where I bought them, or who made them...or for that matter where they are. I know that they came to VA with me. I suspect they are buried under the landscape carpet that compentently prevents the weeds & grass from growing thru into my veggie beds. It's the only explanation. I used to have this garden tool that was like a dandylion puller, but it had a long handle and a bar you pushed with your foot, so you didn't have to bend over to do all the work. Some person who is now cursed with crabgrass forever nicked it out of my garage. I'm constantly loosing the rake. I couldn't even tell you where it is right now. I keep losing my trowels because I keep breaking them! I once had a dandy dandelion digger-outer but it's gone. I think one of my children "borrowed" it and kept it so long they believe they purchased it in the first place. I need to stop missing it and just go buy a new one. I can't find my good gardening gloves and hand tools since we moved. I had a very special red handled stainless steel garden trowel given to me by my husband. It was especially handy because it had a very comfortable feel and just the right grip and leverage on it. My three daughters "help" me garden and alas, it is gone. I sure would appreciate trying this new hoe! I've lost so many tools. From shears to trowels. Thanks. My helpers! That counts, right? They all deserted me and let's face it- I need a hoe-dag so I can get something done around here. My hand held digger tool, it's been misplaced for awhile now. I have lost several spades and several pairs of gardening gloves...I think they grew legs and walked off. I *find* my mind in the garden. I have lost at least a couple of dandelion diggers. I think the dandelions drag them under the ground. Thanks for the contest. Well, I snapped the handle of my favorite shovel! Now it's lost to me cuz I can't use it anymore! I wore the poor thing out! It was the perfect size, I loved that shovel. I haven't found another like it. after he had finished all of his! I once lost my favorite stainless steel trowel...for about 2 months. It was painful! I refused to buy a new one since I knew it was somewhere on our property. I finally found it underneath some vegetable leaves! Oh Joy! gloves! i lost my favorite gloves! found what was left of 'em months later....shredded as bedding for a rat's nest! blechhhhh! do they still count as lost? I had a sweet little hand shovel which I just loved, but for the life of me I can't find! I used it for 33 years from Minnesota, to New Orleans, to Arizona, to California where it disappeared! I miss my garden shovel. I wonder what happened to it? Time's up! Stay tuned to find out who won this great digging/hoeing tool!